Mike Sweitzer-Beckman began working at Edgewood College in 2016 and currently serves as Major Gifts Officer. Prior to joining the College, Mike served as Fund Development Manager at Common Wealth and Director of Development at Holy Wisdom Monastery. He holds a bachelor’s degree in sociology from DePaul University, a master’s degree in divinity from the Jesuit School of Theology at Berkeley, and a master’s degree in business administration from University of Wisconsin-Madison. Mike is an active member of the Madison Chapter of the Association for Fundraising Professionals, the Wisconsin Association of Charitable Gift Planners, and Downtown Madison Inc. 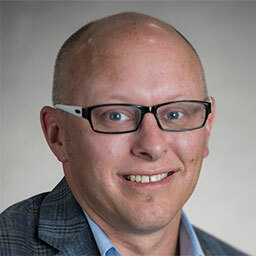 He currently serves on the Scholarship Committee and Diversity Committee for Association of Fundraising Professionals’ Madison Chapter, as well as the Inclusiveness Committee at Downtown Madison Inc. In his free time, Mike enjoys ultimate frisbee, bicycling, and spending time with his family.